Individualized guidance for one of life’s biggest decisions. 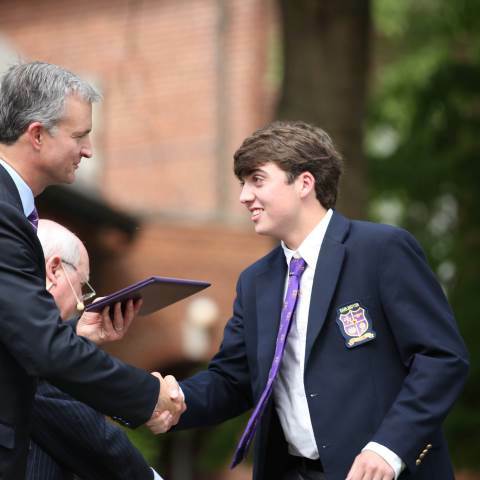 Each year, 100 percent of Darlington’s graduates are accepted to colleges and universities around the world. This speaks volumes about the quality of our students and the school’s dedication to college guidance. Our College Guidance Program, led by 13 seasoned college advisers, will help you select and gain admission to colleges best-suited for you in terms of interests, ability, and academic record. Close to 200 institutions around the country and the world send college admissions representatives to our annual college fair. All Upper School students attend the college fair, which offers each student a great opportunity to research and make personal connections with college representatives. College counseling begins in the freshman and sophomore years and more formal counseling begins the junior year through a series of group sessions on the specifics of the college admission process. Students are assigned individual college advisers and during the senior year, these advisers help students narrow their choices, complete applications and obtain the school recommendations that are required by colleges and universities. Seniors hit the ground running on the first day of school with College Bootcamp. They meet with their college advisors, hear from a series of college admissions pros, and attend small-group session on different topics related to college. Learn about our college counseling timelines and find links to valuable college planning information. Our College Admission Profile gives a great printable overview of the school and a full list of academic programs available.